Want to send us a comment or share your Stanford story? Point out a typo or correct the spelling of Tara VanDerveer’s name for the umpteenth time? Then go ahead and Email us. But be careful, we just might write back (or post your comment)! R: C! I can't believe you! This is the enemy! Going in to the last weekend of regular season basketball, The Stanford Women’s Basketball team controlled their own destiny. They had two games left on the road in Oregon (or as my sister-in-law likes to say, Or-E-gone). A win against the Oregon State Beavers in the second-to-last game would guarantee them first place in the Pac-12 league, a shiny trophy and the number one seed in the Pac-12 tournament, where winner gets an automatic bid to the NCAA tourney. You couldn’t write a more perfect script. Except Stanford forgot to study the script. They came out against the Beavs flat, and did not look like a team fired up to win a championship. Give OSU some credit for having lock down defense, and a scorer named Sidney Wiese, and Stanford could not get anything going offensively. OSU shut down Stanford’s three-point specialist Karlie Samuelson, as well as the rest of the team from behind the arc, and with no made threes, (0-8) and only 47 total points on offense, they did not look like a championship team. They did hold OSU to 50 points, but losing 50-47 hurts. Probably the biggest differentiator was rebounding, in that Stanford forgot how. They box score says it was OSU 47 to Stanford’s 37, but it seemed a lot more lopsided than that, nothing more frustrating as a series for OSU with FIVE O boards! Still, Stanford could have won the regular season if Cal beat Oregon State and Stanford closed out the season with a win against the Oregon Ducks. Stanford did bounce back to get the win at Oregon, 65-59, but they still did not look like a championship caliber team. Cal, the one time we rooted for them, lost. Still, you can’t place your destiny in someone else’s hands, as more often than not you will come up short, as Stanford did. Special shout outs to seniors Karlie with 18 against the Ducks, Erica McCall with a double double (16 points, 14 boards) and Stanford’s favorite beach player as of late, Alanna Smith with 14. 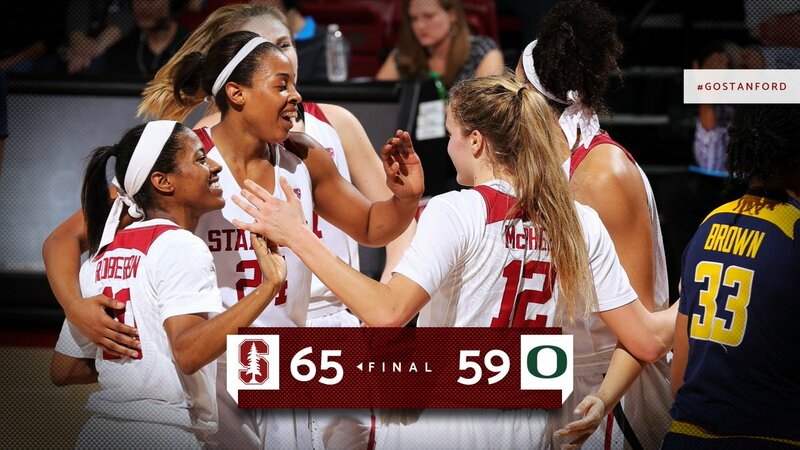 Stanford beats Oregon, ties for 2nd place in Pac-12. Photo courtesy of Stanford WBB. So Oregon won the Pac-12 regular season title with a 16-2 record, and Stanford tied with Washington for second with identical 15-3 records. Stanford gets the number two seed at the upcoming Pac-12 tournament, due to a tie breaker that C and R can’t figure out. Point difference in the two games vs Washington, maybe? So, to recap, Stanford gets a first-round bye for the Pac-12 tournament in Seattle March 2-5 and will play the winner of No. 7 Washington State and No. 10 Colorado on Friday at 6 PM. Tune on to all the games, as you will witness history every time Washington’s Kelsey Plum scores. She just broke the career points scored for D1 women’s hoops, needing 54 points in the next few games. She decided to just get it out of the way and scored 57 in one game. So any more points she scores is gravy. Once again, Stanford controls its own destiny with the start of this tournament. Run the table, win three games in a row this weekend, and they still get the shiny trophy and the Pac-12 tournament champions moniker, and most importantly, the automatic bid to the NCAA tournament. We get so used to seeing wins out of the Stanford Women’s Basketball team, with Tara VanDerveer at the helm. So used to catching victory balls on the home court at Maples Pavilion after those wins. So used to cheering in the face of opposition the times we venture off campus to support the team in a road game. These wins always send C and R home with a smile. However Stanford’s win over USC on Feb. 3 was truly special. We got to celebrate career win #1,000 for Tara VanDerveer and look back on her legendary career. Tara, in her typical understated-ness said this was pretty much like any game, and would be on to victory #1,001 shortly after. However, it was great to see the joy her players had for being part of this historic run and this particular victory. There was Erica “Bird” McCall, all fist-pumping and fired up for hitting a three at the half time buzzer to put the team up 31-22, and running C’s streak of free pizzas (She had guessed 30 points at the half). There was the pure unadulterated glee as Erica and Karlie Samuelson caught Tara unaware as they held a huge orange Gatorade Bucket over Tara’s head, her body language prepared to be doused, only to find out it contained confetti. And the pride the three seniors had, Erica, Karlie and Bri Roberson, presenting Tara with a commemorative plaque with a Stanford jersey with “Vanderveer” on the back and the number 1,000. Stanford Coach Tara VanDerveer celebrates win #1,000. Final score, not that anyone cares, was 58-42, a low scoring affair for Stanford. Wonder if emotions had anything to do with it? The game was close until the third when Karlie Samuelson hit three 3-pointers in quick succession and added a jumper at the buzzer to help Stanford pull away. She would finish with a game-high 21 points. Erica added 18, and Brittany McPhee chipped in ten. But when the final seconds ticked down, and Maples began chanting and cheering, the final score did not matter. More confetti rained down from the ceiling, Pac-12 commissioner Larry Scott gave Tara a commutative trophy. Former player and now much-in-demand TV analyst Ros Gold-Onwude (we said hi, she knew who we were!) summed up the night for the crowd, and finally the microphone was given to the coach herself. Believe it or not, she, the master of dead-panned humor said she was speechless! Then in traditional Tara fashion thanked many and deflected glory. For Tara, echoed the many articles written before the game, the game is not about the victories but about the relationships. A wonderful video tribute played with so many people stating what Tara means to her, including many Stanford fan favorites of ex-players. The night was attended by some of those players, such as Jennifer Azzi, who said more than a coach, Tara has been her friend for life. The game just happened to coincided with National Girls and Women in Sports Day, and in the lobby before the game, C and R walked by Simone Manuel and Katie Ledecky giving autographs and in Simone’s case, wearing flippers on dry land to race a young fan in a swim rely. At half time, Stanford introduced the National Champs in Women’s Volleyball, and just “a few” of Stanford’s Olympians, including Ledecky and Manuel. You know, every day people you might see in class if you went to Stanford. So yes, it was great to make a big deal out of one victory for Tara VanDerveer, lest we forget every victory is special in its own way. Bay Area sports fan, we are lucky to have such a person who strives for success, yet puts more emphasis on watching and helping her players grow. C and R Twitter Feed! Subscribe to C and R! See what our C and R Stanford Women's Basketball Blog website would look like if we had professionals making the pages instead of trying to do it ourselves! C and R's Social Media! C and R’s Stanford Women’s Basketball Blog Facebook Page-Please like us or friend us or otherwise artificially inflate our sense of self worth! Official Stanford Women's Basketball Facebook Page. Women Talk Sports Facebook Page! Follow C and R on Twitter! View Our Last Five Blogs! R: Now this is more like it. We like Nancy Lieberman. C: Uh, the intro is written by Pat Summit! Women's Sports Information found More News about Women's Sports, brought to you by Women Talk Sports. 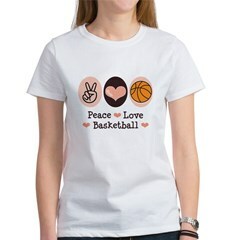 Of which our Women's Basketball Blog is a proud member!